Marketplace configurations are managed in the “Package details” page. These configurations define how packages will be made available to the Segment buyers. 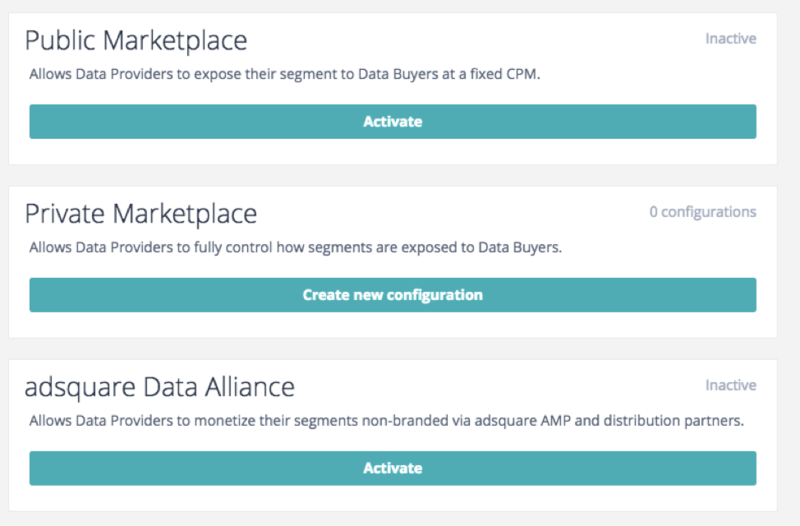 There are three marketplace configurations available, depending on how you want to expose the package and datasets to Segment buyers. Packages on the Public Marketplace are available for all Segment buyers with no restriction. If you activate packages with this option, you only need to set the price. All datasets in the package will be directly visible in the adsquare Segment Modeler / Data Buyer portfolio. Private Marketplace allows you to define who has access to the package and datasets, how the price is set as well as approval options. Multiple configurations can be defined in the Private Marketplace. You can opt-in to monetize your data through ADA either in addition to using Open and/or Private marketplaces, or as your primary monetization strategy. In ADA your data will be bundled in a pool alongside other data providers and normalized into adsquare’s standard taxonomy. Your data in ADA will not be branded, hence it will be automatically available to interested Segment buyers. Opting in for ADA does not mean your data is automatically used, adsquare reserves the right to test and validate the data. Only data meeting quality requirements will be included to ADA.